Let Flower Express help you show your sympathy at the loss of loved ones. We cover all of the Nashville area funeral homes and the surrounding areas. This includes anywhere from Gallatin and Springfield down to Franklin and in between.. We will also deliver to church services and if you get the bad news after the service has passed we can design something appropriate for a home. Call or visit one of our three locations and let our designer’s create a beautiful piece that conveys your condolences. 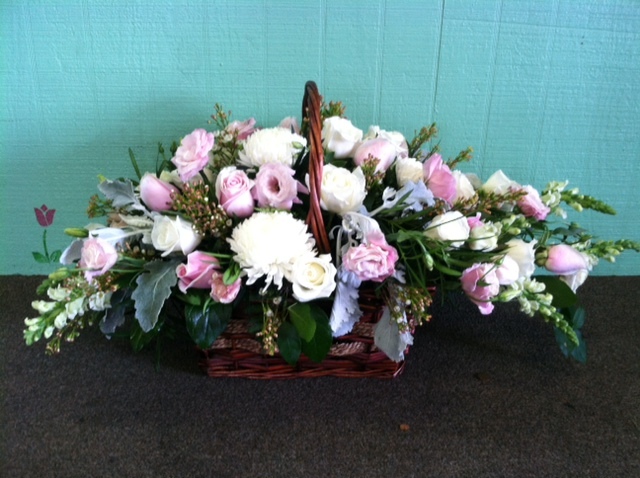 Soft feminine take home funeral basket. Click on our sympathy photo gallery for some in house creations. 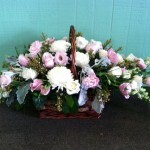 Choose the “order flowers online” tab to the right to view Teleflora pieces that we can replicate and place an order. Previous post: Summer colors abound! !